But I just couldn’t finish the series without a little flavor from the street food of Calcutta (Kolkata). Though many different Asian countries claim for the origin of this dish and among them southern China has the most number of votes, but this particular preparation very well known to everybody who hails from Kolkata or even those who had a visit to the city is typically from the make shift stalls on Kolkata foot paths. There was one such stall near my dance school called Iceberg (quite contradictory for a joint that sold everything hot), and every month it was a ritual for our gang of friends to have an egg roll from there. I still remember it cost just seven rupees then, but still that was quite expensive for a school-going girl like me. At home, outside food was a taboo and so I always had to cook some stories to have those egg rolls. But alas, eventually mom found out my secret and instead of scolding me I was offered with two egg rolls the next day at tiffin, of course prepared by my mom in her kitchen. School days have passed a long time ago, but I still can’t forget the taste of those road side egg rolls, though my mom’s were quite similar but not that good. My father suggested that the dirt from the road made it taste better. 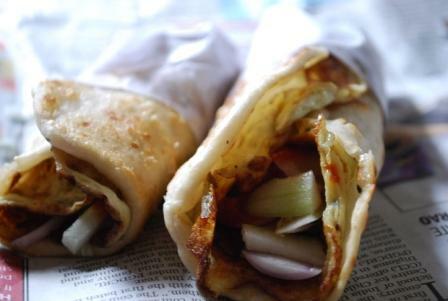 The egg roll in Kolkata is similar to Frankie of Mumbai and resembles the kathi rolls prepared in many roadside stalls throughout India. Egg roll in Kolkata was probably first introduced by Nizam’s, a very popular restaurant in Kolkata serving Mughlai dishes. Another famous joint serving egg roll in Kolkata is Haji Saheb in Behala (Hazi Saheb for some), it’s my personal request, don’t miss it if you ever visit this place. Hot tips – You can put in a filling of mashed potatoes seasoned with chili powder and salt or even a filling with chicken or mutton kebab tastes great. What variety of Egg Roll do you prefer? Sending this to NTTC#5 event hosted by Sneh of Gel’s Kitchen. As a person who is now living away from his home for the first time, the fact that I can no longer relish the streets foods of Kolkata on a daily basis is really depressing. The Frankies here in Mumbai don’t really do it for me. i cook the same just with a twist. Instead of having the prathas i use already baked wheat roti. As it saves lot of time and also reduces lots and lots of calories. And also i heat roti first and then beat egg on the roti and then roll it over. Will try your idea of getting the egg on tawa first. I really enjoyed this post. I love how you make your recipes personal and I didn’t expect to get such a warm feeling from a post about egg rolls. PS I think your dad is right about the the dirt 🙂 There’s got to be something special about street food that makes it so good sometimes. .-= Nikki´s last blog ..Buy a chapati maker – How to make chapati in a roti machine =-. Thank you so much for your comment. I just can’t stop having the street foods, its so tempting :). The AC restaurants and hotels are at their positions, but there can’t be any competition with those road side shops. .-= nags´s last blog ..Vegetable Spring Rolls – Step by Step Recipe =-. Thanks nags for the complement. Did a little research on the subject and the rest I filled it up with my feelings :). .-= Hari Chandana´s last blog ..Venna Vundalu – Butter balls =-. Love to eat it any time. Will cook soon. Thanks for dropping by. Please let me know when you prepare the egg roll and also what reaction you got from your family.